The trouble began a few years ago, at the Syracuse show. I had just dropped a sizeable chunk of pocket change on a new NCE PowerCab, thus hurtling myself headlong into the world of Digital Command Control. With only two decoder-equipped locomotives in my entire fleet at that point, I had some tough choices to make. In order to get more decoders, I had to swear off buying any more locomotives for a while. It was easy at first, but then the GG-1 on the table winked at me. I’ve always loved GG-1s. In the world of railroading, many locomotives don’t last beyond their 15-year trust certificates. Have we amortized that piece of junk yet? Good, get it out of here. By contrast, the GG-1 was a stunning success story. The first one, originally billed as the underdog in the competition for the Pennsylvania Railroad’s next electric locomotive, won handily, spawned 138 production examples, and went on to have a 48-year service life itself. No wonder Gs are so popular. I had the opportunity to see GG-1s in action, just barely. My family spent the night once at a motel just south of Enola yard, sometime in the late ’70s. I awoke the next morning to a growing low rumble, stepped outside, and watched as a pair of extremely dirty Gs lugged a long freight train past. God, it was like visiting the age of the dinosaurs. Extinction came before our next vacation, unfortunately. Today, I’m modelling in N scale, with a focus on northern Pennsylvania, circa 1963. I have some Pennsy equipment, also some Erie Lackawanna, and some short-line stuff. The PRR electrified zone ended a hundred miles away from the area I model, but no matter. There, on the table, was Kato’s magnificent new GG-1, and it was in the green wide-stripe scheme, no less. I was powerless to resist. Not that I didn’t make a token effort to do so. I didn’t buy it that day. I knew the vendor, though, and I knew I’d see him at other shows later in the season. So I asked him to set it aside for me. I started socking away the money. By Christmas, it was mine. Or vice versa. Like I said, my memory of Gs in action was on freight, and in their later years, they moved a lot of it. 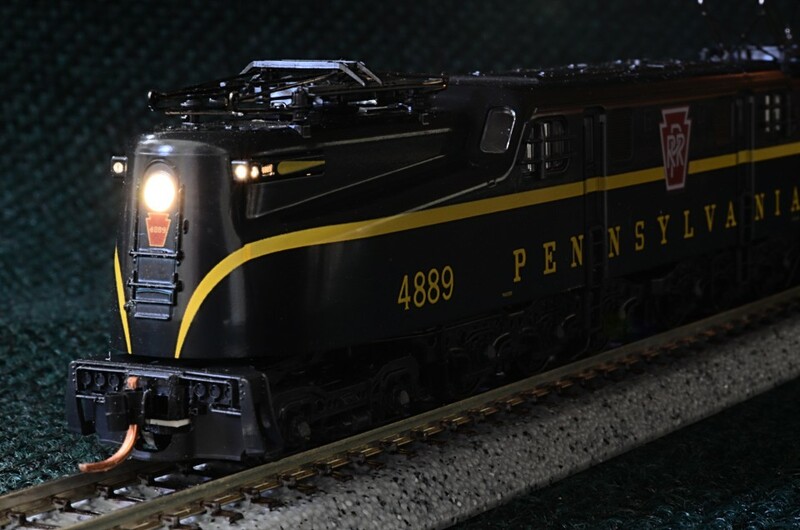 Originally, they were built for long-distance passenger service, hauling the Pennsy’s vaunted “Blue Ribbon Fleet” all points east of Harrisburg. But hey, I’m northern Pennsylvania, remember, where passenger trains were all but gone by 1963. No temptation here, right? Now, if you’ve been married for a while, you know that there is a threshold for hobby purchases. Items below that threshold will escape scrutiny, and perhaps even escape notice. Items above that threshold will place you in some degree of jeopardy. The GG-1 was below the threshold, but the Broadway set was not. I braced myself for the firestorm, prepared my defense, and practiced the murky art of being a very, very good husband. When the inevitable came, I did my best to provide assurance that this kind of thing would hardly ever happen again. There’s an ironic footnote to this chapter: six weeks after I purchased the Broadway set, the hobby shop burned to the ground. When I pointed out to my wife that had I not purchased it, the set likely would have gone up in smoke, she was less begrudging about it. She hates to see things go to waste. So I have the G, and the G has a Broadway Limited to haul. The G elbowed its way to the top of my decoder-installation list, not surprisingly. The Broadway cars demanded—and received—lighting kits. Now the entire train is ganging up on me and insisting upon its own layout. Not necessarily a large one, but something with properly-sized curves, and catenary poles. Oh, I’m going to be in trouble again. CUTE…WHO’S GOT ROOM FOR IT???? ?